Simple stone house directly on the sea with big terrace 5 meter from the sea. The place is rather quiet and direct on the sea,so you can feel and smell the sea.And the view is something you should expirience. The house is sorounded by pines, lourels,olives and other mediteranean plants. The house is fully equiped.Barbecue is always ready for use.Domestic products are easy to find,or we can find it for you.So you are only thing that miss.In the front of the house is stone pier so you can swim just in the front of the house,or if you like beach,you have bigger one westerly ,or smaller one easterly , 2 minutes walk.Or if that is not enough you have 5 km long sandy beach 15 minutes drive from Klek. The property is just outside the village so everything is 5 minutes walk,by the sea, from the house.Two retorants,pizzeria,post office,ambulance,grocery shop,tenis courts etc. 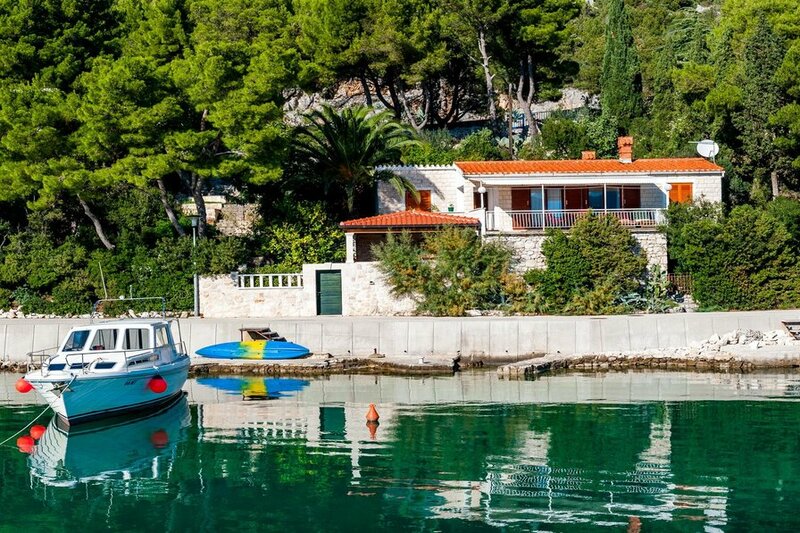 Lot of nice places is about 1 hour drive from Klek,like Dubrovnik,Korcula,and Ston ,beautifull ancient cities,or Mostar pearl of orient.But you need car for this places. If you dont want to drive you can walk on local hills or spend day aboard old sailling boat Lipa moja and enjoy the beauty of seaside with wisit of old city Mali Ston and small places in the area. If you would like to be more active you can go on canuing or rafting on river Neretva or Cetina or ride bike to the river delta. Or you can just lie down and enjoy the sun and sea. View from the terrace is something that is worth to see.Babeque is always ready to accept new cook.So everything is up to you. Just come and enjoy.